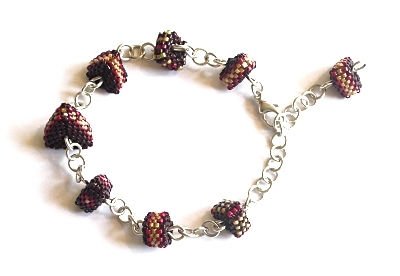 This bracelet is made up of my first geometric beading samples and was the start of my Geometric Beadwork Series. After discovering I could use increases and decreases to make shapes, I experiemented and beaded triangles, squares, pentagons and hexagons. Years after making the samples I turned them into a simple bracelet to keep them together. When I returned to the samples, I liked the patterns I had made along the sides and wanted to use this in a new piece, and so my first Triangular Necklace was born.